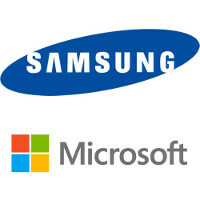 Samsung plans on having some Microsoft services and apps pre-installed on some of its Android phones and tablets. Some of this isn't news as Samsung announced at MWC earlier this month that the Samsung Galaxy S6 and Samsung Galaxy S6 edge would come with Microsoft OneNote, OneDrive and Skype out of the box. In addition, both handsets will come with an additional 100GB of free cloud storage from OneDrive. In the first half of this year, Samsung will outfit some of its tablets with Microsoft Word, Excel, PowerPoint, OneNote, OneDrive, and Skype out of the box. Businesses purchasing devices directly from Samsung's business to business sales team will have a choice to select one of three versions of Office 365 along with Samsung's KNOX security container. Office 365 allows users to access Microsoft's myriad applications like email, calendar, document reader and video-conferencing. KNOX allow users to switch from the apps used at home to a secure set of apps for work. "Great things happen when you converge services and devices. Our partnership with Samsung is emblematic of our efforts to bring the best of Microsoft’s productivity services to everyone, on every device – so people can be productive wherever, however and whenever they want. "-Peggy Johnson, executive vice president of business development, Microsoft. The partnership between the two companies flourished after both settled a lawsuit filed by Microsoft that claimed Samsung owed it for unpaid interest due from a late royalty payment related to Android patents. As an android user I love having onedrive. My favorite cloud storage. Probably part of the patent settlement/agreement they had. Really applauds Microsoft's business model. I was happy when Microsoft finally launch Office for my Note Pro 12.2". word, excel, and power point are very useful apps fro tablets. Microsoft is better than Google. I wish Samsung released a Windows 10 phone with Galaxy S6 specs. Unfortunately, WP isn't better than Android. They went the Apple route, when they should have kept it more WinMo like. That is your opinion, for myself Windows Phone is superior to Android as an OS. Look at Android and IOS visually they are clearly Windows UI inspired. Well that your opinion as well. I really have a strong dislike for Microsoft business practice. When they have a software Monopoly they charge us an insane amount for their OS and other software licenses. I paid $300 for Foxpro so that i could do some work at home. Now, they use patent ligation to force OEM to preinstall their software whether they wanted it or not. If i want to use Mobile Office i could download it myself and remove it by will. Liveitup, i am tired of you making claim on other OS are visually Windows UI inspired. Please show us the proof or be quiet. Windows 8 UI are blocks layout, show me which part of iOS or Android default UI does that. The OS is more than just visuals.....which is what tedkord was talking more about I assume. Just like the OS is more than the home screen setup, icon layout. I agree with him too. They shoulda kept it more like Win Mo. WP started out too much of a hybrid of iOS and Win Mo, Android when they should have just chose a more direct path. And that path shoulda been Win Mo, IMO. And....you really, really harping on the Flat UI thing huh...lol. Thats clearly your opinion. Not fact. And we've been over this before. They're inspired by Swiss Design. Only in your delusional Microsoft fanboy world with a psychotic hatred of all things Google did Android and others copy Windows UI. Get over it already. History say otherwise so does my software licensing payment to Microsoft. Even MS know lumias are a dead cause. Good for samsung's customers. Funny how Android users here applaud Samsung's decision to preload MS apps yet Windows Central members are going batsh!t crazy. Which is odd since this isnt affecting any WP devices.... It would make more sense of Android users were going crazy...lol. I would think if you root for your preferred company to grow you would want this. This helps MS on the software side of things. Then again I can understand why some are going crazy....because IMO you dont offer potentially exclusive apps to your competition. Whats the incentive for getting a WP device for those apps when they can be had with an Android device? Preloading anything that's not part of an OS will drive me nuts. But I understand that this is the way all devices are subsidized otherwise your next andrpid phone will cost much much more. Nexus is the only one that keeps it clean but Google looses money on each one but gains in more people using Google services = more eyes on their ads - a win for customer and manufacturer and Google I guess. I doubt Google is losing money on the Nexus 6. As long as they can be uninstalled, I don't care. I have no need for any Microsoft services outside of working hours, when I am being paid to use them. Excel is just the hands down best spreadsheet there is. Though I'm sure the mobile version is lacking things like VB (but it world be awesome if it had it). Oh, I know, but I have zero use for it on my phone. If my company needs me to work after hours on stuff like that, they would give me a WP handset. Their work and my devices don't mix. Google Docs and Drive is poor compared to Office and One Drive. Good, now make an ATIV phone with Exynos 7420. This is only, in my opinion, a win for users if we are allowed to uninstall the apps if we don't want them. I have nothing against MS I prefer the Google apps because I can uninstall them or install them. If they can't be uninstalled then MS is really not doing anyone any good. it will be back to what they were doing on the desktops not to long ago. I really think Samsung should give this option if not I am happy Android has a strong modding community like XDA. In no time their will be a root and ROM which bloats everything ( but I hope Samsung listened to it's users like it did on the design side also on the software side).